The general weakening of the Asian markets led to a decrease in AUDUSD quotes. Yesterday, we talked about the fact that there was no particular demand for this asset, and we waited for buyers to take the initiative, but there was no such initiative. 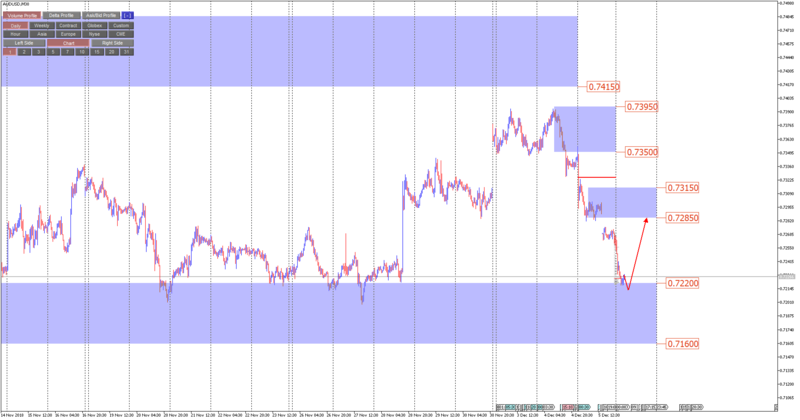 Moreover, the pair declined to support 0.7220-0.7160. And it is quite indicative, since this is the lower range of the largest volume zone. And the appearance of the price below 0.7160 should tell us about the development of the downward trend. The financial market generally accelerates before Christmas, and, second, the volumes that we usually analyse cease to be indicative, as the rollover process begins, when investors are shifted from the old CME exchange futures contract to the new. So, the volumes that we can interpret as an initiative, in fact, may turn out to be just test entries. But, nevertheless, suppose that the pair will at least stop in the fall. 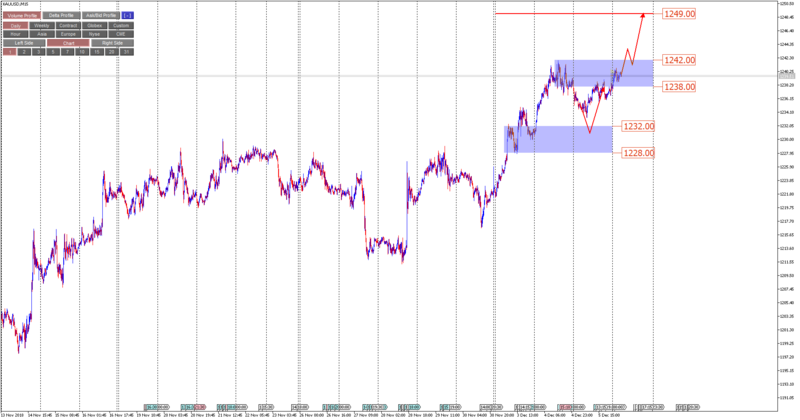 Accordingly, it is worth looking for a point of entry into the purchase in the range of 0.7220-0.7160. Since only there may appear the initiative of buyers and the corresponding interest. And we strongly recommend the use of additional signals and patterns for making decisions on the purchase, and the goal is to set 0.7285. Not more. One of the few instruments with a trend structure in principle. The price is at the top of the entire futures volume, and I would like to see continued growth. In any case, this scenario should be the most promising. However, in order to make a purchase decision, you need to see the manifestation of buyers' initiative, a breakdown of 1242 and only after that we are buying from a rollback with a target of 1249. Do not forget that the S & P500 has fallen dramatically and also the fact that today there is a lot of statistics that can add additional volatility to this asset.